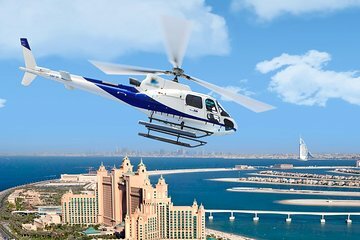 A melhor apresentação para novos visitantes em Dubai, este passeio VIP de helicóptero acompanha as principais atrações da cidade - do ar. Tenha uma espiada no Burj Khalifa, nas Wind Towers, no litoral de Jumeirah e em muitos outros pontos de referência enquanto ouve comentários ao vivo de seu piloto. Passeios de luxo incluem embarque e desembarque no hotel e bebidas leves. We had our driver pick us up at the hotel in a private car (BMW). He was very nice and drove appropriately to the helipad. He waited while we completed our tour and offered to drop us off at another location if we wanted to do some shopping at the mall or something. The helicopter tour itself was extremely exciting. We brought our 15 and 11 year old daughters and they loved it as well. It was a great experience and a fabulous way to see the coast of Dubai.